Airports are like islands of misfit advertising. If you’re ever tired of just getting from point A to B, try being an ad critic; airports are often blessed with unusually bad advertising. This week’s ads feature Lebron James, who last week astonished both Celtics with his skill and the media with his dumbassery. As my hometown Celtics take him on, I thought you’d enjoy this series of ads. I was recently in Cleveland, consulting and taking pictures of bad ads, when I was stopped by this huge ad below. Its was about 30 feet across and placed right where you exit the secure part of the airport. 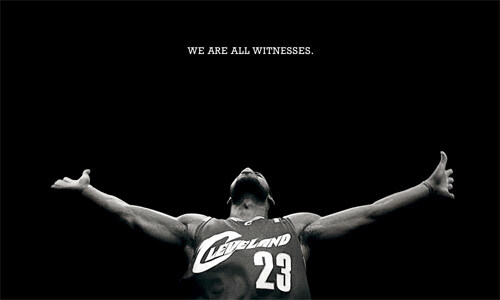 “Witness what?” I wondered. I didn’t get it and started asking locals and photographing the ad. Suddenly three TSA security staff arrived…but rather than asking me to put my camera away, they all gladly helped explain their disgust for Lebron James, and how this ad is a giant slap back at him. They quite approved of it. I still didn’t get it. They explained that Nike and the Cavaliers had built a whole campaign around witnessing Lebron’s greatness before he abandoned Cleveland. I hadn’t seen the ads, as I live and blog from beneath a rock apparently. 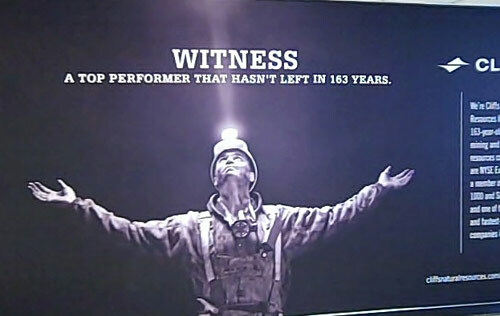 Cliffs, a fairly unknown local coal-mining energy company, took out a ton of ads that tap in to the Cleveland fans’ anger about Lebron’s flashy exit from their city to greener NBA fields. One TSA screener pointed out that Cliff’s ad was both fantastic and hypocritical itself. After all, though Cliffs was still in Cleveland, “Cleveland” was no longer in Cliffs. They had been known as “Cleveland Cliffs” until a few years back, when they dropped the local affiliation from their name. Nonetheless, they’re hiring, still local, and defending their HQ city’s honor. The fact that I needed a team of TSA screeners to explain the Cliff’s ad didn’t make this think that ad was too great at first. But of course, I am clearly not the target market. A relatively unknown firm earned huge local brand cred by tapping into a common vibe, or meme. That still beats the dreck you might see from Accenture, or the US Mint. Do you see crazy advertising in airports or elsewhere? I love getting examples from friends, and I’ll gladly post your finds. If you have to travel and find yourself killing time at the airport, try your hand at advertising curation. It’s a quirky local canvass, and sometimes you’ll find breakthrough creative in the most unexpected places. Bad Airport Advertising #534: Let’s Get You a Machine Gun. Bad Airport Advertising #535: Only the Mint Can Make Money Look Cheap. 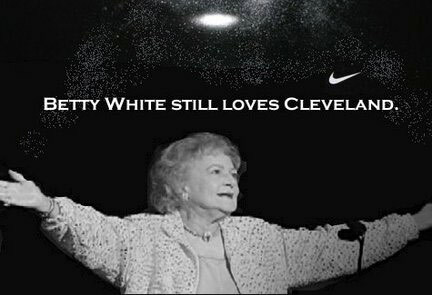 2 Responses to "Witness Lebron James, Betty White, and More Bad Advertising at the Airport"
This is an older post but I’d figure I’d still chime in. I am a millennial so maybe I’m better positioned to get this ad BUT I’m not from Cleveland, I don’t follow basketball..and yet I still got the reference just from subconsciously digesting Nike’s Lebron Witnesss campaign. I wouldn’t have thought twice about this being a “bad” advertisement that needed explaining.